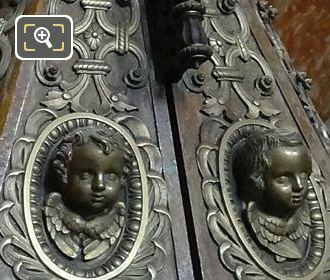 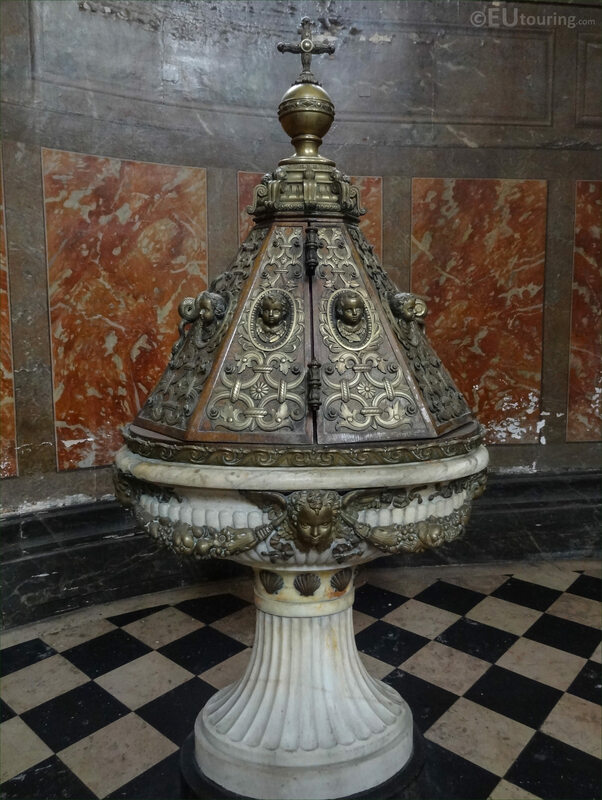 We were at the Eglise Saint-Roch in the 1st Arrondissement of Paris, when we took these high definition photos showing La Fontaine Baptismale, or in English, the Baptismal Font. You will normally find that a Baptismal Font is located close to the entrance of a church to remind believers when they go to worship, and in this first HD photo you can see La Fontaine Baptismale located within an area of the Eglise Saint-Roch called La Chapelle des Fonts Baptismaux. 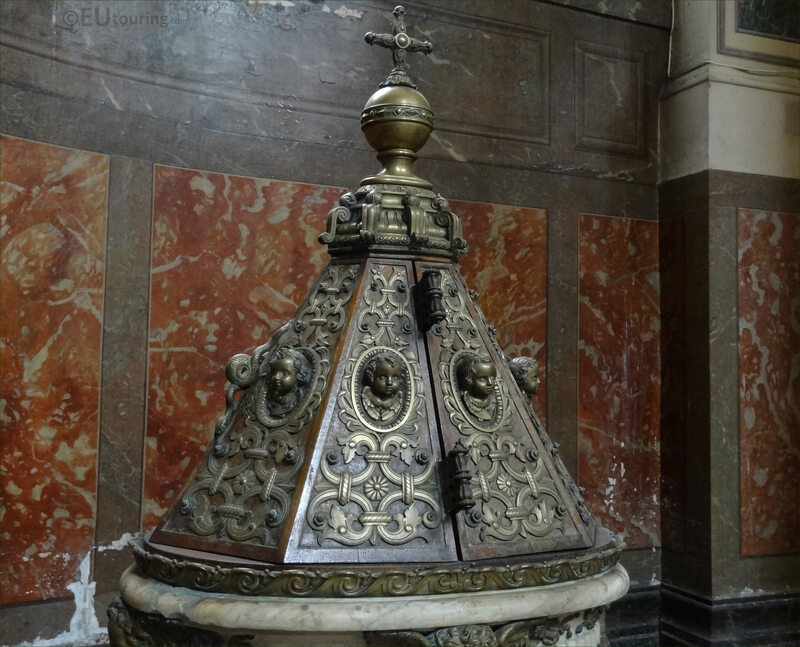 In early Christianity a person would normally be completely submerged, known as full immersion, however as the Christian faith grew when people wanted their baby baptised, smaller fonts were designed that the priest could then perform the ritual while holding a young child. 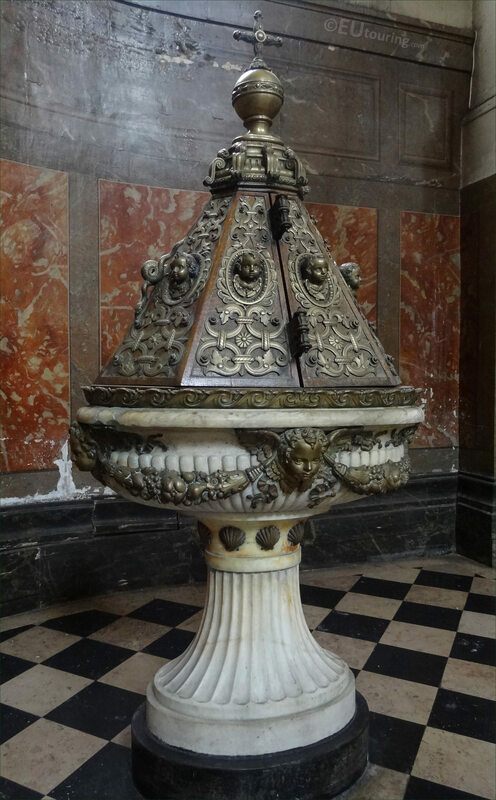 Over time, they then had covers designed to go over them in an ornate, usually eight sided design, with the octagonal form symbolising the eighth day, which depicts the resurrection of Christ, and normally locked, often made of wood or metal, the idea was to keep the Holy Water sacred and pure, but also so that it could not be contaminated, just as you can see in this photograph. Now this particular Baptismal Font was produced in 1845 with a marble pedestal base along with a cedar wood and metal ornate octagonal cover decorated with cherubs and of course the orb with the cross positioned at the very top, which has a specific name of a Globus Cruciger. 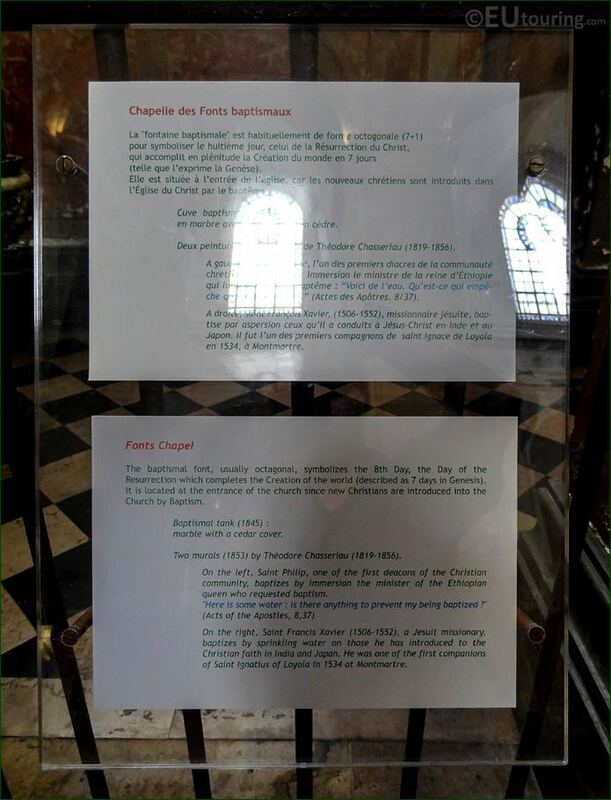 So here you can see the tourist information board that has been written in French and then in English that provides more information about La Fontaine Baptismale, which can be found within the dedicated chapel area called La Chapelle des Fonts Baptismaux, to the left hand side of the Eglise Saint-Roch, just as you have entered the church, that is located on the Rue Saint-Honore in the 1st Arrondissement of Paris.